Perth - South Africa staged yet another rousing fightback after a disastrous start to the third and deciding Test match against Australia at the WACA ground on Friday, claiming two late wickets to reduce the home side to 33-2 in reply to their own first innings score of 225. Graeme Smith’s decision to bat first back-fired in spectacular fashion when the tourists crashed to 75-6 in the 31st over until Adelaide hero, Faf de Plessis, orchestrated a reconstruction of the innings in the company of Robin Peterson (31) and Vernon Philander (30). Du Plessis matched his first innings score in the Adelaide Test with an unbeaten 78 but ran out of partners before he could attempt to match the unbeaten century which saved the match. 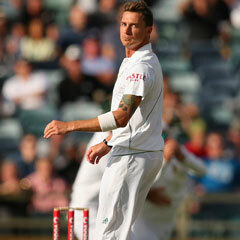 His shot selection was both varied and astute throughout the innings, a mix of attack and defence which steadily clawed the Proteas towards respectability and then back into the match, a fact confirmed when Dale Steyn and Philander claimed a wicket apiece late in the day. Opener Ed Cowan edged his first delivery from Dale Steyn low to Jacques Kallis at second slip to depart for a golden duck and Shane Watson (10) was trapped lbw by Philander although he needed the assistance of third umpire Billy Bowden, having persuaded captain Smith to ask for a review. The Perth crowd rose in unison to give Ricky Ponting a standing ovation as he prepared to walk to the wicket for the final 25 minutes – but the man who appeared was, in fact, nightwatchman Nathan Lyon. He survived to the close in the company of David Warner who will resume on 12. Smith (16) was the first to depart in the Proteas first innings, having looked largely untroubled in an opening partnership of 38 until edging a Watson delivery to Michael Clarke at slip. Opening partner Alviro Petersen (30) was bowled by left-armer Mitchell Starc and Kallis (2) went in similar fashion on the stroke of lunch with the scoreboard reading 63-3. Even worse was to follow after the break when Hashim Amla (11) was run out by a direct hit from Warner, AB de Villiers (4) edged debutant seamer John Hastings to Clarke at slip and South Africa’s debutant, Dean Elgar, gloved a Mitchell Johnson bouncer to ‘keeper Matth Wade for a duck. Du Plessis impressed with the obduracy of his defence a week ago, but this time runs mattered and he drove the ball stylishly, pulled with efficiency and deflected skilfully to reach 78 not out from 141 deliveries with a dozen fours. Partnerships of 57 and 64 with Peterson and Philander gave the Proteas a chance but the total still looks significantly below par and it will take a huge bowling effort to prevent the home side compiling a significant first innings lead.